Welcome to my gallery raysofexpression! These four art pieces are Limited Edition Prints of my original drawings: "Pride of a Nation", "Journey of Generations", "Wrapped in Heritage" and "A Grandmother's Worth" and together, as a set, they comprise "The Generations Series". Collect all four of these art pieces so you can own the entire set of "The Generations Series" collection. There were 500 prints made of each of these pieces during the printing run of this edition and afterwards the plates were destroyed so no additional reproductions will ever be made. Each print is signed and numbered by me, the artist, at the time of purchase and a certificate of authenticity is included with each piece. From the South West Pueblos of Arizona to the Western Plains of Montana and everywhere in between, I have been creating Western American Indian art for over 20 years. 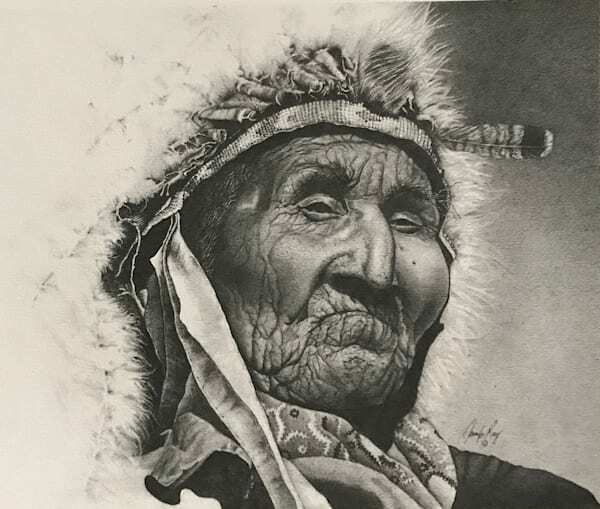 Whether a proud chief, an Assiniboine mother and child, a Zuni warrior, a Navajo Grandmother displaying all her turquoise or just some weary travelers on a journey to a better place, my art reflects the struggles and triumphs of each person I draw. I love expressing the details of texture and contrast on paper. Every image tells a story and as you explore the details of each wrinkle, you can experience their story and feel what they must have gone through.